NEXT is the obvious one. Another piece of NEXT ICE, taxing enough later in the game to not regret. Blue Sun: Uninstall the other ICE you rez. Put this on a scoring remote. The runner needs AI breakers, Femme or Inside Job or they cannot get in. Exceedingly strong, but hard to set up. It could, theoretically, synergize with other ICE that don't have Barrier/Code Gate/Sentry for their subtypes. Right now, the list is pretty short: Traps and Excalibur, and kinda sorta Chimera, at least until all the breakers are out. This could be a tricky set of ICE, but it would be porous. Jinteki, maybe? From a card interaction standpoint, it doesn't get much more interesting, ICE-wise. This is a fun, stong card. Flagging an amusing if not completely practical interaction with Test Ground. Mother Goddess only counts rezzed ICE, so in an emergency one could use Test Ground to derez key ICE to remove key subtypes from her. This can even be performed mid-run! Of course this interaction should be used incidentally only, with the main purpose of Test Ground being to derez almost-exhausted economy assets, but sometimes it's worth giving up a lot for one turn of surprise lockout. Also possesses minor synergy with Howler (the ICE Howler spits out gets derezzed afterwards) and can act as a stopgap behind a Bioroid Efficiency Research targeted Bioroid, provided other offending ICE do not exist yet (If the bioroid ICE is broken, it derezzes and Mother Goddess loses its subtypes). Combined with the NEXT ICE and Haas-Bioroid: Stronger Together synergies already mentioned, there's some potential for fun interactions in a few HB builds. Running it with Chimera and the aforementioned Howler can provide a nice way to shut out a few early accesses while you get your glacier running. Howler even gets your glacier partly built as it does its work, without forcing you to give up on Mother Goddess's protection immediately. A good example of this is placing Mother Goddess on HQ or R&D, then Howler on either the other one or a remote. This provides one run's worth of regular ICE on the Howler server without compromising Goddess, as well as getting the ICE installed and ready to rez once you're ready to move into the full on glacier phase of the game. And you don't have to sit it in front of a central, either. It costs 4 to rez which can be quite steep early game, but it's a good way to defend an early economy asset with a single ICE that will probably require more trouble than it's worth to get through just to get rid of an Adonis Campaign or something. 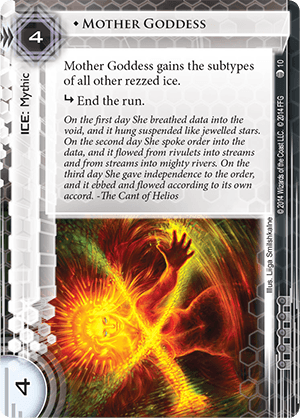 Overall, a Haas-Bioroid deck with a number of these elements already baked in could potentially benefit from Mother Goddess.